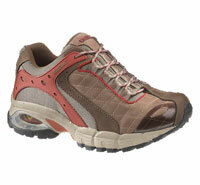 The Sierra from Wolverine is another in the increasingly popular 'super trainer' category. However, I think the Sierra does stand out from this particular crowd because of Wolverine's proprietary iCS (individual comfort system) technology. The iCS enables you to customise the level of inner support, outer support, firmness and degree of cushioning provided by the heel section of the midsole. This is achieved via a removable insole that gives access to a disc in the heel area which you set to suit you. The adjustment is easy to make and there are four options available: Firm (suggested for all day wear), Outer support (for those with higher arches and/or for those who wear their shoes at the outside edge aka supination), Inner support (for those with fallen arches and/or those whose shoes wear at the inside edge - aka pronation) and Cushion (for extra cushioning and therefore maximum shock absorption). I was wearing a US size 10/Medium - I'm female and usually wear a UK size seven and a half in walking boots - but these fitted fine. There is a wider fitting available - but I think these are a relatively wide fitting shoe anyway. With some generous padding around ankle and tongue, the well cushioned sole plus the customisable heel midsole, these are certainly a well apportioned shoe. I've worn them for low level and casual walking on small amounts of snow, in light rain, on grass and on tarmac and my feet have stayed dry and comfortable. I do tend to over-pronate so I'd set the iCS to the option providing inner support. Whilst I wouldn't abandon my bespoke orthotic entirely, I thought the iCS provided quite impressive arch support. I've been wearing them during Autumn and an early Winter with good walking socks - and my feet have been plenty warm enough. The removable inner sole does have some perforations to help reduce the build up of sweat which I imagine will be of more benefit in warmer weather - I've yet to really test this feature! The laces are a little insubstantial and rather too long; however, this doesn't detract from what is a very comfortable shoe. Wolverine's Sierra is essentially a high spec trainer. Whilst not the best option for use over rugged terrain - the Sierra is certainly a very comfortable shoe for low level walking such as along canal toe-paths and more general everyday walking/casual use.